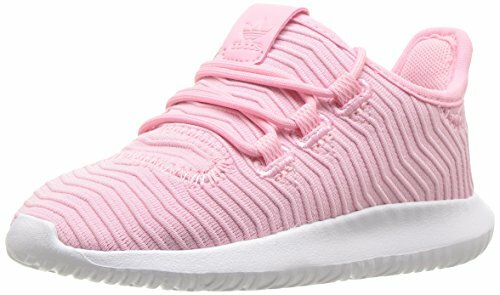 Give your little one the kicks you'd love to wear with the adidas® Originals Kids Tubular Shadow INF! Featuring a unique knit upper, this sneaker exudes the cool, casual comfort you and your mini me can wear! Mélange knit upper with a unique 3D diamond pattern. Lace-up closure with a high heel tab. Burrito tongue for a snug and cozy fit. Soft and breathable textile linings for a comfortable wear inside shoe. Breathable and performance enhancing OrthoLite® sockliner. Lightweight EVA midsole for all-day wear. Durable rubber outsole. Imported. Measurements: Weight: 3 oz Product measurements were taken using size 8 Toddler, width M. Please note that measurements may vary by size. Weight of footwear is based on a single item, not a pair. Give your little one the kicks you'd love to wear with the adidas® Originals Kids Tubular Shadow INF! Featuring a unique knit upper, this sneaker exudes the cool, casual comfort you and your mini me can wear! Soft and breathable textile linings for a comfortable wear inside shoe. Breathable and performance enhancing OrthoLite® sockliner. Lightweight EVA midsole for all-day wear. Durable rubber outsole. Imported. Measurements: Weight: 3 oz Product measurements were taken using size 8 Toddler, width M. Please note that measurements may vary by size. Weight of footwear is based on a single item, not a pair.